A water right is a legal right to use surface or groundwater. Water rights allow a specific amount of water from a specific water source to be diverted, impounded, or withdrawn for a specific use. Homeowners using private wells and springs for their household water need to have a water right for this use. In Alaska, you don't automatically own a water right on your private property, but you can apply for one. DO I NEED WATER RIGHTS? 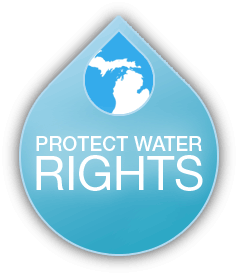 Water rights protect your use of the groundwater accessed by your private well. To preserve your continued right to use the quantity of water you are accustomed to, your water rights certificate would demonstrate your prior use. If there are already water rights attached to your land -- for example, if a previous owner already secured them in the past -- you do not need to re-apply for them. To find out if you already have water rights, find your property's legal description (from a Deed or tax bill) and call the Water Resources Program of the Alaska Department of Natural Resources (ADNR) at 907.269.8600. Alternatively, you can check the mapping application on ADNR's website here. When using the mapping application, be sure and select the "Water Rights" box in the left hand column. If you don't already have water rights for your private well, follow the steps below to apply for them through the Alaska Department of Natural Resources. The Application for Water Right is the first step in securing water rights on your property. You will need to provide information about the legal description of the property, location of the water source, description of the water source. The application will also ask you about the method of taking water and amount of water. If you are not yet taking water from the ground or surface source, for example, if your well or spring has not yet been developed, those questions will be asked by ADNR when your water system is completed. To find your well log, you can search for it using the ADNR Well Log Tracking System (WELTS). You can either search by Driller Name, Owner Name, Property Description or by Location. Generally, it is easier to search by location, which is defined by the Meridian, Township, Range and Section legal description of your property. This legal description can be found on your Deed or tax bill. Unfortunately, the WELTS database is not very easy to use, and also does not have all of the well logs in Alaska since many logs were never filed. Call ADNR at 907.269.8600 if you are having trouble finding your well log. Another option would be to call the company that drilled your well. The one-time fee for water rights for a single-family residence or duplex is $100.